With Pizza, anything is possible! Sharon is the American College of Healthcare Architects (ACHA) Spring 2019 issue spotlighted Certificant! Click on image on the left, turn to page 3, and find out how what motivates her and excites her about healthcare architecture! Please join us in extending best wishes to PF&A Design Associate Lynne Manning who is retiring! Lynne has been an esteemed member of the firm for five years and she will be greatly missed by staff and clients alike. We have all benefited from her talent as an interior designer and amicability as a leader, colleague, and friend! We know she is eager to catch up on time with her family and the community work that she loves so much. We wish Lynne well as she starts a new chapter in her interesting life! Fifth Annual Soup Day today! What an awesome way to warm our bellies on this very cold winter day in Norfolk! Terry, thank you for the delicious spread of homemade soups and corn bread. You have spoiled us once again! A special shout-out to Norfolk’s Brick Anchor Brew House for providing us with the perfect venue, tasty food and the most clever drink menus in town! Join us in congratulating our newest Associates, Sara Heppe, NCARB, AIA, LEED AP BD+C, CDT and David Peronnet, NCARB, AIA! Sara and David joined PF&A as project architects in 2015 and 2016 respectively and have since, with their talent and leadership, greatly contributed to the success of the firm. A graduate of the University of Virginia, Sara has more than ten years of professional experience in architecture. Along with her award winning design skills, Sara is fully committed to sustainability and high performance buildings because of their benefits to their owners, their communities, and their environments. Her experience encompasses projects for higher education facilities, labs, and a variety of healthcare spaces ranging from inpatient behavioral health to new outpatient buildings. David offers over twenty years of professional architectural experience and holds several degrees including a Master of Architecture from the University of Houston. David has a diverse design background that includes graphic design work for major USA companies, design education and publishing, and architectural work that ranges from single family residences, laboratories, liturgical buildings, and healthcare facilities. Congratulations! ‘Spooky’ by Stephanie B. is this year’s winner! ‘You missed’ by Phil H.
Pun-kins, pop-kins, creative-kins abound. 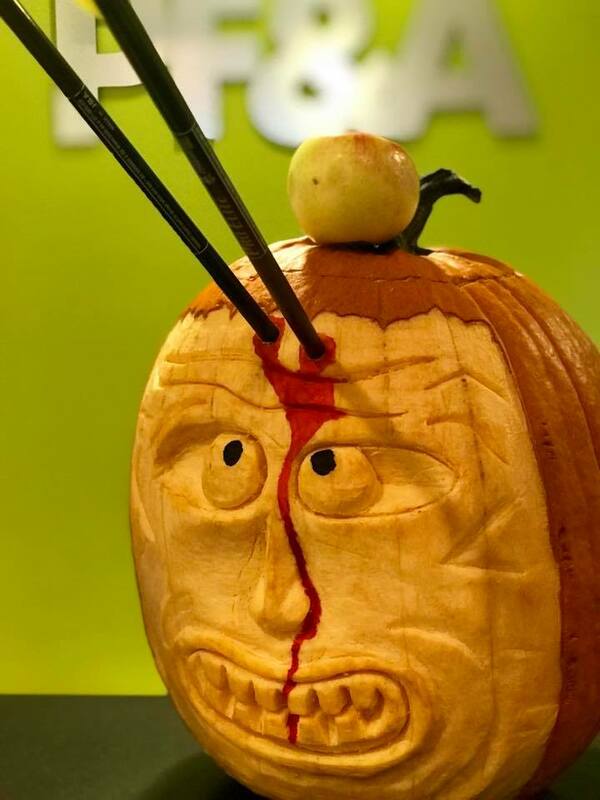 A 'gourd' time at PF&A's second annual Pumpkin Carving Contest! We might have a small crop this year - but it’s mighty big on creativity and talent! Sharon L. Szalai Receives ACHA Board Certificate! The American College of Healthcare Architects (ACHA) has announced that Sharon L. Szalai, Principal at PF&A Design has earned her Board Certificate in healthcare architecture. Szalai recently passed an accredited examination, which assesses the knowledge and understanding of architects who practice as healthcare specialists. She joins the ranks of over 400 ACHA colleagues in the US and Canada who have received this important architectural credential. Congratulations on your accomplishment Sharon! Good Food! Good Company! Good Times! Thank you Trost family for hosting PF&A's pool party 2018! PF&A Design is proud to announce that Jonathan Hiser, Assoc. AIA successfully completed his Architect Registration Examination (ARE) and is a newly licensed architect. The ARE is administered by the National Council of Architectural Registration Boards (NCARB). The ARE is designed to assess aspects of architectural practice that affect the integrity, soundness, and health impact of a building. The exam also assesses an architect’s responsibilities within firms, such as managing projects and coordinating the work of other professionals. Jonathan joined PF&A in 2016 and is an integral part of the firm and our architecture practice. Jonathan earned his Master of Architecture degree from Virginia Tech. His experience includes all phases of design through construction management. He has worked on several large projects including a 30,000SF Rehab, Physical Therapy and Transitional Care Unit for our local Children’s Hospital and a Cancer Center addition in Richmond, Virginia. "Learning from a fire hose"
"Learning from a fire hose" - This is how Sara described her and Sharon's week of intensive study on Laboratory Design at Hardvard's TH Chan School of Public Health. As always, we will be accessible to answer any of your questions, if needed, during the off hours. PF&A was just treated to the Fourth Annual Soup Day! The menu included vegan chili, coconut curried chicken stew, white bean and Italian sausage, and cornbread - each homemade! Terry, you are an amazing cook! From the entire staff, "Thank you Terry, Layne, and Stanley Stephens Co., Inc.!" Great PF&A Design holiday party at O'Connor's last night! Congratulations Emily on earning the National Council for Interior Design Qualification (NCIDQ) certificate! This certification for professional interior designers demonstrates her proficiency and experience in designing solutions that are functional, aesthetically appealing, and protects the life, safety, and welfare of the community. Ms. Bickel joined PF&A in 2013 and she brings significant experience in space planning, furniture and finish selections as well as lighting and interior design. She is highly skilled in employing the latest Revit modeling tools to create photoreaslistic renderings and illustrations. The Little Angry Pumpkin" by Phil H.
Pun-kins, pop-kins, creative-kins abound. 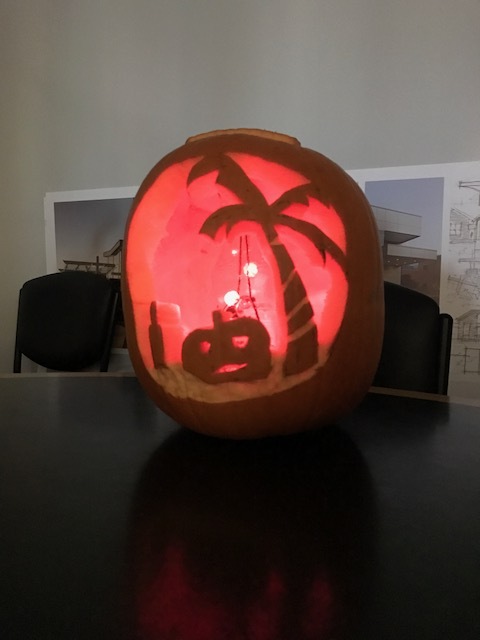 A 'gourd' time at PF&A's first annual Pumpkin Carving Contest! "Zucca Arcimboldo" by Betsy K.
"Halloween Happy Hour Holiday" by Joe T.
"Pumpkin Pi" by Jonathan H.
"I'll Get you My Pretty" by Stephanie B. "Oh yeah! It's the Kool Aid Guy" by Sara H.
"Stranger Things" by Becky W.
PF&A is pleased to announce that Kimberly J. Bernheimer has been named Associate Principal. Kim’s contributions and commitment to our clients over the years have been outstanding and have advanced the growth of PF&A Design over the years. PF&A is proud to be able to recognize those who are leading the firm and driving transformational change for our clients! Congratulations Becky on earning the National Council for Interior Design Qualification (NCIDQ) certificate! Mrs. Wall joined PF&A in 2015 and she brings significant experience in space planning, furniture and finish selections as well as lighting and interior design.